For punters in search of table on a weekend night in our capital city, who have become accustomed to seeing photos of smiling Irish chefs holding trophies at yet another food awards ceremony, the idea that everything in the restaurant business is not 100pc peachy may be hard to swallow. But among those who work in the industry there's an amount of doom and gloom around. Food prices are on the up, as are rates and insurance. A flurry of restaurant closures last month - Seapoint in Monkstown, Brioche in Ranelagh, both Dublin, Fenns Quay in Cork and Harry's in Bridgend, Co Donegal - and mutterings about the reduced 9pc VAT rate that currently applies in the hospitality industry have sent a chill wind whistling through the business. More than anything, though, the restaurant industry is worried about chronic staff shortages, both in the kitchen and on the floor. Restaurants are not easy places to work. Gender and diversity issues make kitchens, with their reputation for an engendered macho culture full of shouting and swearing, inhospitable to many. Wages are low, hours are long and the lifestyle is anti-social and anti-family. The pressure in a busy kitchen to produce food quickly and consistently time after time can exacerbate pre-existing mental health issues. And the housing crisis means that restaurant staff working late hours are often faced with a long commute at the end of the day. In Cork, however, one restaurant group is doing things very differently. 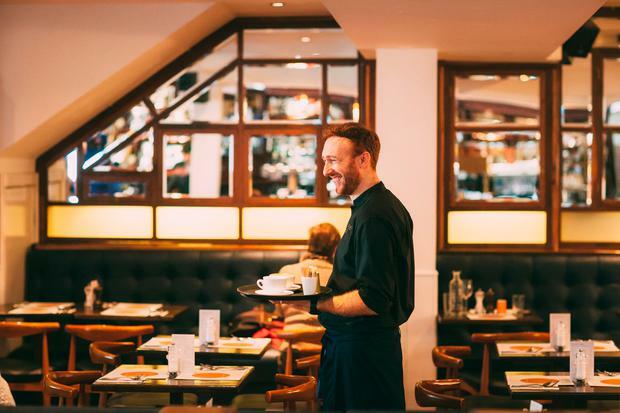 The Market Lane group of restaurants - that incorporates Market Lane, Elbow Lane, Orso and the Castle Cafe in Blackrock Castle - puts serious effort into hiring, training and retaining staff and business is booming as a result. Unusually, the group is almost exactly gender-balanced. Conrad Howard, from Waterford - who, with his business partners, Tracey Sweeney and Julie Howard (his wife), owns the Market Lane Group - is a restaurant industry veteran of almost 30 years standing. He started out in London, where he spent 10 years, and then joined Jay Bourke's mini-empire, first at Eden in Dublin, and then in Cork where he looked after the restaurants, pubs and nightclubs in the group. "In 2006 and 2007, the storm clouds were gathering," says Howard, talking in the upstairs dining room of Market Lane in the lull between the bustling lunch and dinner services, "and I was made redundant. I started looking at premises and happened upon this, which used to be the Aoife Landers, a music pub. I could see the potential, and opened in 2007 with 150 covers. The next year, the economy fell off a cliff." Thankfully, says Howard, he and his partners had deliberately focused on value from the outset. "Cork is acutely aware of value," he says. "There's a very fine balance to be achieved." Combined with good food provenance, and a sense that they were bringing something new to the city, the premise worked and they survived the tough years. These days, the restaurant does 3,000 to 4,000 covers a week. At any one time, the Market Lane Group has around 150 employees, with small seasonal variations. "Recruitment used to be a sign in the window," says Howard, "and that is still is the most effective thing, but you have to do other things as well. We have recruitment agencies and use online portals, our own website, Facebook, Twitter and word of mouth. We have to be inventive, offer incentives such as employee referral bonuses, and go the extra mile to attract people. "As an employer, you have to change the game. When I first started, there was this authoritarian streak running through the business - mister this, mister that. It's not the army, and that's not the kind of environment that people want to work in. No matter how bad the recession, people have freedom of choice, and as an employer you need to be able to provide people with a reason to want to come to work, because if you don't do that they have no reason to want to up their game in terms of service or to care about the operation or the mission. "Here, we hold each other up and push people forward as much as possible. Being a disciplinarian isn't the answer, offering fellas €25 an hour is not the answer long term - it has to be career-driven. "For us, the service in our restaurants is the distillation of all the months training, of all the thought on the part of the chefs, of the wine and cocktail and craft beer offering, of the minimal bits of advertising that we do… that all comes together in the 'hello' at the table. If our floor staff have the bedrock of good training to fall back on, they can let their personality shine through at the table. Without that training, how can they be natural and friendly and welcoming at the table? And for the training to make sense, it's down to us to show them that there's development within the group and there's a future; that's our aim. "When I was in my late 20s, I wanted to know that this was the industry for me, and that I didn't have to leave it to get a real job because this was a real job. We take it seriously, and a lot of people pay their mortgages through this restaurant and the other businesses that we own. If that's the case and we have that responsibility on our shoulders, then we need to offer [good working conditions]. It's really logical to us to make accommodations for one of our staff who's pregnant, for instance, and around maternity leave, and when she comes back from maternity leave we'll make more accommodations - and we are delighted to do so. The pay-off for us is that she comes back into our business with the decade of experience that she's built up to bring to our customers." When it comes to recruiting chefs, Market Lane has a relationship with Cork Institute of Technology and presents at its annual milk round, and recently also presented at a catering college in Barcelona where they were surprised to find themselves one of five companies - from the US, Germany and Belgium - pitching to the graduating class, confirming that Ireland is not the only country in which there is a huge demand for chefs. Staff whose first language is not English are enrolled in language classes if appropriate. Restaurant staff typically work long hours, but that's not the case for employees of the Market Lane Group. "In one of my early jobs in the industry," recalls Howard, "I worked a double shift on a Sunday, and then Tuesday, Wednesday, Thursday, Friday and Saturday nights. Monday was my only day off. My father said that I looked like a skeleton, and it was true - not helped by the fact that the restaurant was underground. When you are working like that you get into this terrible routine of sleeping all day, getting up at two, drinking coffee to stay awake. You can't expect people to do that forever. "We don't believe in the macho culture of 60-hour work weeks. The staff get paid fortnightly and it's rare to see more than 78 hours on a payslip, except at peak times like Christmas." Market Lane has two kitchens, each with its own distinctive work practices. "The chefs in the service kitchen react well to the pressure of the printer spitting dockets, and cooking to order; they like a fast-paced environment and we schedule them to work four long days, say from noon until nine or 10 in the evening, after which they get three days off. I worked in restaurants where chefs were throwing things at each other - you can't expect people to tolerate that kind of thing. Even though it's very busy, and it's not a nunnery, head chef Pam Kelly insists on pleases and thank yous - the culture is respect-driven. "The prep kitchen has a different way of working. They cook larger quantities of food and are very organised, they work a standard 8am to 4pm day, five days a week. It's methodical rather than pressurised." Tips are shared via a pooled system that includes everyone (other than management) from the kitchen porter bringing in the potatoes in the morning to the cleaner. New floor staff participate as soon as they have completed their five-day basic training - at the end of which they have to pass a written test. For Howard, personality is the key when it comes to hiring floor staff. "Experience is important but if someone comes in and dazzles with a smile… that's what this industry is about: snatched impressions. We can train you to carry a tray and deliver food, and train you around wine and beer and whiskey, and make sure you are safe at work with manual handling and all that, but personality is so important." Howard believes that Market Lane's system of in-house training is an important factor in the retention of staff. "We were really disorganised for a very long time, but then we realised that we should link people with expertise in our business with each other and make that part of procurement and menu-writing. We have people with expertise in beer, wine, whiskey and coffee, who train the other staff. It started informally with Russell Garrett [the brewer at Elbow Lane's on-site nano-brewery] talking informally to staff and enthusing them. We have now formalised that into a training session, called 'From Grain to Glass', that takes place four or five times a year and is open to the staff from all our businesses, whatever their role. "Our wine experts are WSET qualified, and they put on a session once a month, and it's the same with our coffee expert, Yuliyan. Our staff are encouraged to go on day courses and learn new skills - we're happy to pay the fees and the only requirement is that they have to tell us about it and file a written report. "Chefs can move to another restaurant in the group to learn different skills - Orso is Lebanese-Moroccan, the Castle Cafe is Mediterranean - or spend time in the prep kitchen or pastry section. We have a young chef initiative which gives them an opportunity to put on a pop-up - which is like having their own restaurant for a night. If you make a mistake on a Tuesday night, what's the worst thing that can happen? We have managers who started as kitchen porters because of the interest they had and they opportunities they were given. Staff upskilling might mean that they leave me, but I'll get the benefit of it for a while, and perhaps they might stay with me for 10 years." The Market Lane Group has evolved a partnership model for its businesses, with the partners coming up through the staff. At Castle Cafe, which opened in 2011, their partner is Jerry O'Sullivan, who worked with Howard at Jay Bourke's Bodega and on the floor at Market Lane. At Orso, which opened in 2012, their partner is Dee Munnelly who also came from the floor staff at Market Lane. Stephen Kehoe is their partner in Elbow Lane; he was formerly head chef in Market Lane. "We have deep roots with the people we go into business with," says Howard. "People come together and coalesce around an idea, and once a decision is made the premises seem to come together and plan is formed." Currently, Market Lane has plans to open a coffee roastery and cafe in partnership with Yuliyan, and there is another restaurant concept that Howard says is "ready to go". He says that there is no ambition to have 20 restaurants, and that profit is not the group's principal motivation. "Margins rise and fall, it all needs careful management. We want to do something we are proud of, and while we are not bottom-line merchants, we respect that we need a solid financial ground. We are not beholden to shareholders, holding our heads up high and the collective effort is what matters. We would rather do a great thing for 5pc margin rather than something mediocre for 10pc."